Cataract is responsible for 48% of the population becoming totally blind. In addition, more than 60 million people suffer from glaucoma and this number is expected to reach 80 million by 2020. An increasing aging population is also resulting in more people suffering from refractive errors. It is estimated that in the U.S. and Europe, refractive errors affect more than 30% of the population aged 40 or older. However, the economic slowdown and drying pipeline of ophthalmology drugs is restricting the market. The ophthalmology drugs and devices market is divided into four major segments, namely, surgical devices, diagnostic and monitoring devices, vision care, and drugs. The devices market is divided into applications like surgery and diagnostics. Drugs market is classified into existing treatment drugs and drugs in pipeline and the vision care market is segmented into spectacles and contact lenses. The total market is forecasted till 2017. This market is also considered by formulation types such as capsules, gels, eye drops, ointment, and eye solutions. Advancements in technologies, high prevalence rates of refractive error, cataract, and glaucoma, increasing demand for the diagnostic procedures and low compliance with pharmaceuticals will propel the devices market. However, lack of awareness of diseases like glaucoma hinders the growth of this market. The drugs market will grow at a slower pace mainly due to the combined effect of loss of patent protection for several drugs and drying pipeline. The geographies covered in this study are North America, Europe, Asia-Pacific (APAC) and Rest of the world (RoW). North America is the largest market for ophthalmology drugs and devices, followed by Europe and Asia. North America and Europe is expected to grow at a slower pace, primarily due to the economic slowdown and saturation in these markets. 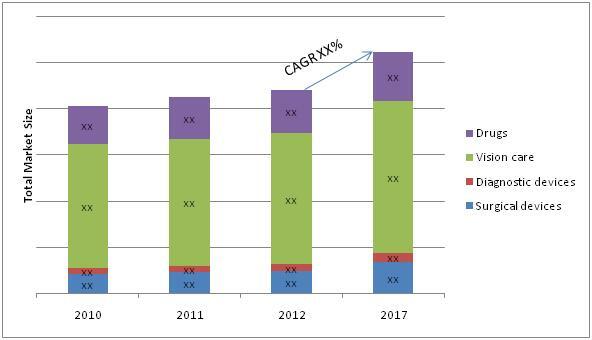 APAC is an unsaturated market, especially China and India, and these regions are expected to drive the growth of the overall ophthalmology market, mainly due to growing awareness of eye diseases and increasing disposable income. The research report categorizes the global ophthalmology drugs and devices market into diagnostic devices, surgical devices, vision care and drugs. All these markets are broken down into segments and sub-segments, providing exhaustive value analysis for 2010, 2011 and 2012, as well as forecast up to 2017. Each of the devices market is comprehensively analyzed at a granular level by geography (North America, Europe, Asia, and Rest of the World) to provide in-depth information on the global scenario. However, the drugs market is analyzed in the U.S., Europe, Japan, Asia, and Rest of the world. The report does not include the following: The services and accessories market for ophthalmology devices, consumables/disposables associated with the devices, and combination devices. The ophthalmology drugs and devices market is divided into four major segments, namely, surgical devices, diagnostic and monitoring devices, vision care, and drugs. The ophthalmology drugs and devices market is mainly driven by the increasing aging population, large pool of patients with eye diseases, changing demographics and geographical trends, and increased focus on combination therapies of drugs. There is also growing awareness of eye diseases in developing countries, which provides significant growth opportunities in this market. Technological advancement in devices is another factor driving the market. However, economic slowdown and drying pipeline of ophthalmology drugs is restricting the market. North America is estimated to have the largest share in the global ophthalmology devices market in 2012, followed by Europe, and Asia. Developed geographies like North America and Europe are likely to grow at low CAGRs. On one hand, reasonably favorable reimbursement structures and government involvement is reducing economic costs associated with the disease, while on the other hand, economic slowdown and the eurozone debt crisis is hindering the growth of these geographies, though not to a great extent. Growth in the APAC market, especially China and India, is likely to be propelled by a largely untapped patient base, gradually increasing awareness, rising disposable income, and focus of major players in this market. The drug market is mainly driven by retinal disorder and dry eye drugs, which show positive CAGRs in the forecast period. The retinal disorder drug market was monopolized by Lucentis till 2011, which was responsible for the positive growth in this market. Eylea, which was launched in early 2012, will drive this market further, affecting the share of Lucentis and surpass its sales by 2016. Similar to the retinal disorder market, the dry eye drug market was also driven by one brand, Restasis. The other brands like Hyalein and Diquas are prominent in Japan and Asian countries. To date, there is no pharmaceutical treatment approved in Europe for dry eye. However, pipeline products Cyclokat and SAR1118 (Lifitegrast) will soon change the situation. Most of the major glaucoma drugs have lost patent protection or will do so soon, which will hamper the growth of this market. Moreover, only two drugs are in the late stage of clinical research, estimated for launch only in 2013. The key players in the ophthalmology drug market are Alcon (U.S.), Allergan (U.S.), Merck (U.S.), Pfizer (U.S.), Roche (Switzerland), and Santen (Japan). In the devices field, prominent players are Abbott Medical Optics (U.S.), Alcon, Bausch & Lomb, Inc. (U.S.), Carl Zeiss Meditec (Germany), Essilor (France), Johnson & Johnson (U.S.), Nidek (Japan), and Topcon (Japan). Alcon is the leading player in the surgical devices business, whereas Topcon is the leader in the diagnostic devices market. Each segment of ophthalmology is dominated by different players owing to their core competencies.